As the legal parent or guardian, I release and hold harmless GYMNASTICS WORLD, LLC AND/OR THE PLATFORM, its owners and operators from any and all liability, claims, demands, and causes of action whatsoever, arising out of or related to any loss, damage, or injury, including death, that may be sustained by the participant and/or the undersigned, while in or upon the premises or any premises under the control and supervision of GYMNASTICS WORLD, LLC and/or THE PLATFORM, its owners and operators or in route to or from any of said premises. The undersigned gives permission to GYMNASTICS WORLD, LLC and/or THE PLATFORM, its owners and operators to seek medical treatment for the participant in the event they are not able to reach a parent or guardian. I hereby declare any physical/mental problems, restrictions, or condition and/or declare the participant to be in good physical and mental health. I request that our doctor/physician ________________ be called and that my child be transported to ______________________ hospital. Please include physicians' phone number _______________. 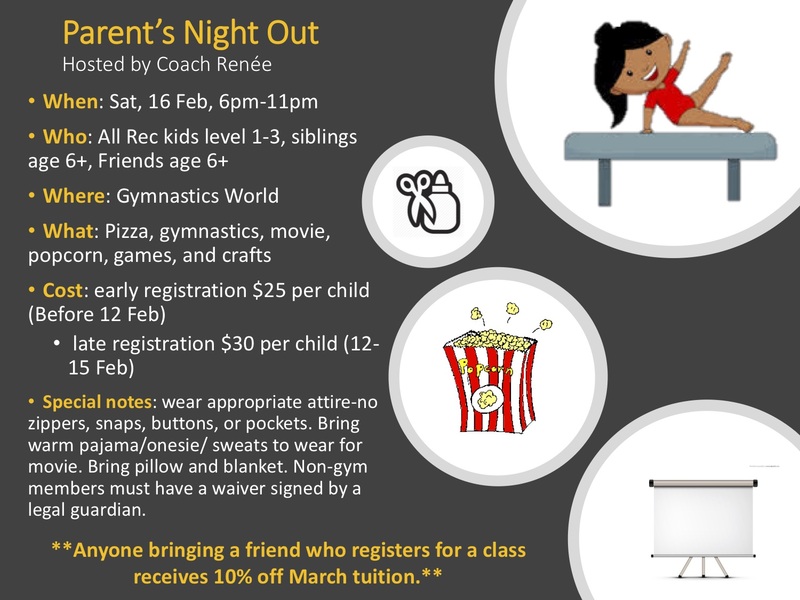 All fees associated to the Parents Night Out must be paid before your child is dropped at our facility on the day of the event. There is a $35.00 returned check charge for any checks returned by the bank. Fees must be paid up front by cash, check or credit/debit card.